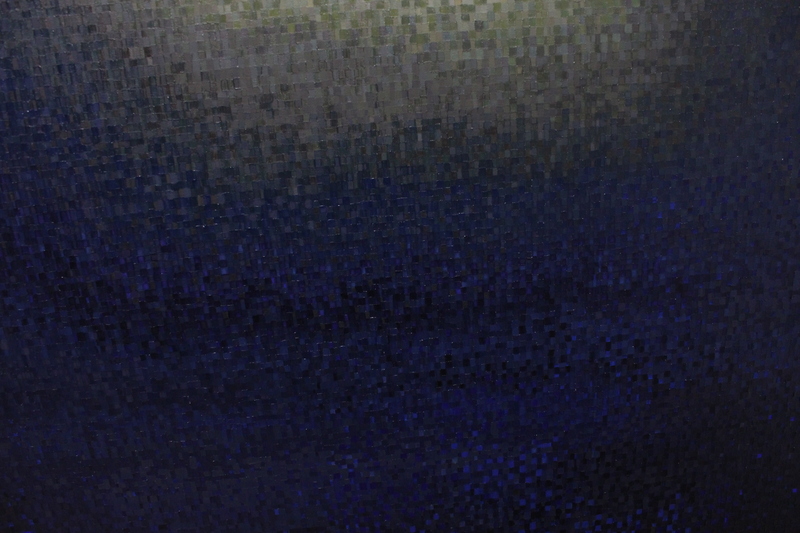 A subjectivity immersed in the deep sea, looking up at the sun through miles of water. This is the second grid painting I’ve completed, the first since Pale Composition. The idea for this painting came from a number of different directions at once. For one thing, while working on these grid paintings it is necessary to remain very close to the canvas with a relatively small brush and to make marks while maintaining a deep concentration and sustained focus. While painting Pale Composition, I often referred to returning to the work as “deep sea diving”. 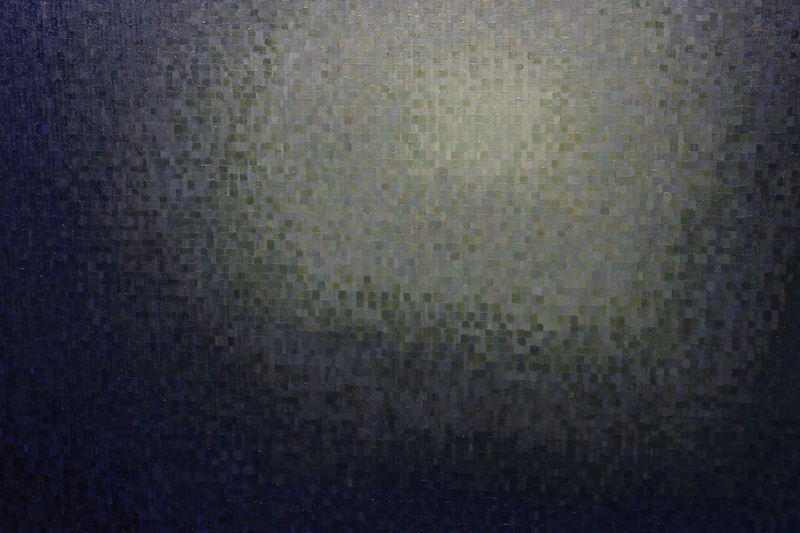 I noticed that when I get close to the canvas to fill in the squares of the grid with color, I hold my breath. I also happen to paint in the basement. Painting these grids is comparable to deep sea diving in the sense that I have to immerse myself in the work, and paint in bursts of intensity before stepping back to exhale, and begin breathing again. 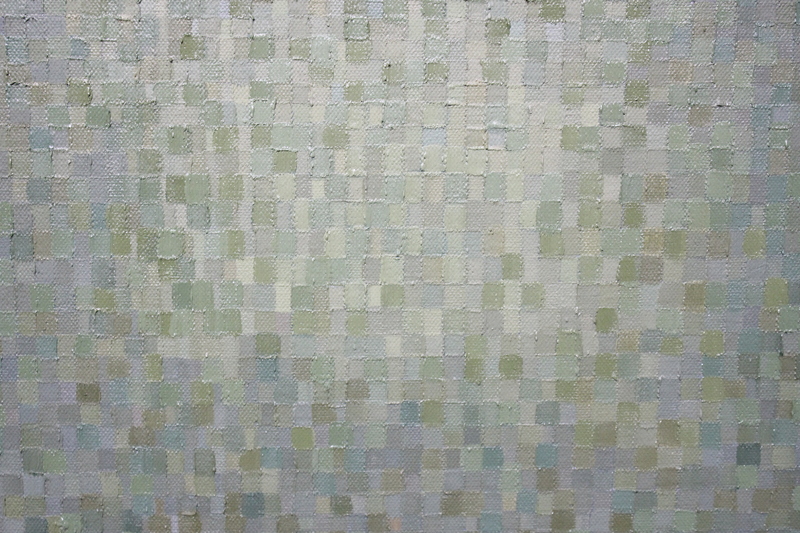 Part of the intention of these grid paintings is to make manifest intangible concepts like patience and faith, so the way that they are painted is very important to how they are seen. I think, or I hope, that when someone looks at one of these grid paintings it becomes almost necessary to think about how it was made, the patience that was required and the amount of time that went in. 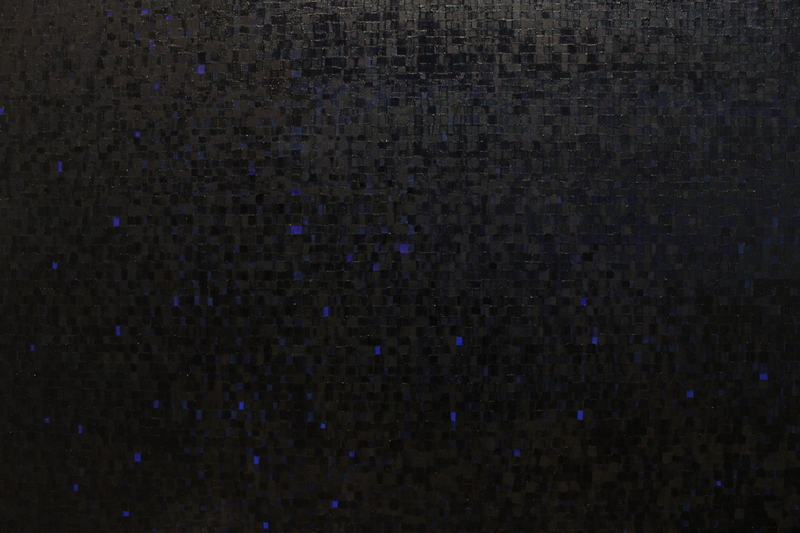 So Deep Sea is a bit self-reflexive in this way, the imagery is linked to the process of painting it. Feeling as though one is underwater seems to me to be a feeling that many have shared. On an emotional level, this image feels very visceral to me, it came from somewhere under my heart. Looking up toward the sun through miles of water. I want the painting to be related to on this level more than any other. Attaching the feeling and image to the grid was for me just a way to create a more far-reaching image that attaches in multiple directions. Ultimately I feel that this is an image of despair, but that the creation of the object was a transcendence of despair. This transcendence I think has become embedded in the object, it is part of its expression and effect on a viewer. Another realm of thought that I think attaches well here is maybe a bit theory-heavy or over-intellectual, but it fits nonetheless. The grid to me represents the foundation of human understanding from a universal perspective. Human life is built upon a grid-like system of understanding based on knowledge and the sciences. Our understanding of ourselves as individuals is a process that we learn through pre-existing forms and human sciences, biology, psychology, we do not seek the possibilities of what we are capable of, but learn the conditions by which we may succeed. Figuring out “who you are” is the equivalent to deep sea diving in a cage, perhaps stretching your arm out into the depth or looking toward a dark shadow of a gloomy whale that rests inside you. Our thoughts are only valid once they are structured in the way we have been taught to think, communication is productive when it is in the voice of reason. For the most part we build our identities with bits of mimicry, our hardwired desires we satisfy increasingly through institutions. The grid to me, is the zero-point, it is all that is left when you remove all particulars of our current lives. It is the universal resting point that I cannot see beyond at this interval in human history. In a more direct way, the content of this painting is aware that the Sea right now is under siege by biological investigation, military testing, garbage dumping, fracking, you name it. The way we are building our world, or the way that humans are taking over the earth, is now extending to the deep sea. Just this week two sea serpents washed up on the shores of California. The grid of our human civilization is beginning to reach the Deep Sea. This painting takes place at the limit of human civilization. The painting is a like a fishing net, attempting to catch as many interpretations as possible, to be as open and far-reaching as an image is capable of being. These grid paintings are aware on these levels, the practice of painting them is intended to be a counter-cultural practice, the patience and sustained focus it requires to paint them, and to complete them, seems to me a direct confrontation with boredom and the attention deficit of our national culture, resistance to immediate and fleeting satisfaction, and entertainment distracting us from what is important at every turn – we have confused conceptions of success and ambition in this country, success in the system is often the death of the spirit. Receiving these paintings I hope has a similar effect to what goes in to creating them, causing one to think in a way one does not normally think, the goal of art is to alter one’s thought process. This painting, like “In Utero,” is absolutely astonishing; I find the accompanying text quite compelling, too. I know that my philosopher friends will want to look and think along with this work. Many thanks for such encouraging words, I truly appreciate the comment. Very happy to hear from you, I hope all is well, and please share the work with friends. Are you willing to have images of your work used in modified format to create a 3D image within a sci fi novel about the deep sea? Low budget on this end, but would credit your work. Let me know your thoughts. Thank you! sure! as long as there is credit, send me a link once your novel is complete, sounds cool – thanks for reaching out.